Tips for Gearing Up for the 2018 Construction Season from Your Minneapolis Real Estate Attorney: What You Can Expect — Minneapolis MN Real Estate and Eminent Domain Lawyer | Morphew Law Office, P.L.L.C. The short but intense Minnesota construction season is nearly upon us. Crews are already putting out orange drums and signs announcing impending lane closures. As a Twin Cities commuter, you'll want to start gearing up for the 2018 construction season with these tips from your Minneapolis real estate attorney. Here’s a look at the top road projects affecting the Twin Cities metro area in 2018. We’ll start with the massive I-35W project that will replace bridges, add a rapid bus stop, and add two exit ramps. Road and lane closures are already starting so crews can dismantle bridges. This summer, three lanes will be open going northbound, including a MnPASS lane. Two lanes will be open southbound. Most ramps north of 42nd Street will be closed for most of the summer, including the eastbound I-94 ramp to southbound I-35W and the northbound I-35W ramp to westbound I-94. The Bottom Line: Buckle up. This one is going to be a major headache. To add insult to injury, this project won’t completely wrap until 2021. Minnesota Highway 62 is a major commuter corridor in the southwest Twin Cities. Drivers expect delays during rush hour, but a resurfacing project this summer will add more congestion. Lane closures, shoulder closures, and detours are in your near future along this thoroughfare. Some short-term closures at Tracy Avenue and Clearwater Drive will limit access throughout the summer. The Bottom Line: You know it’s going to be bad when MNDOT itself warns the work “is likely to result in congestion.” Plan an alternate route. 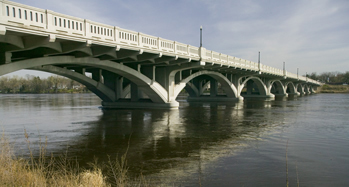 It’s year two on the project to replace bridges for MN-169 over Elm Creek in Champlin. Bridge and lane closures start in mid-April and will run through September. Expect reduced lanes northbound just south of the Mississippi River to impact your evening commute from downtown Minneapolis. The Bottom Line: The old bridges needed to go, and we’ll get a smoother ride through this section of 169 once the project’s completed this fall. The north metro will have its own headache on Highway 65, a major corridor to Minneapolis and St. Paul. Work in Ham Lake and East Bethel will improve safety at the Viking Boulevard, 143rd Avenue, 153rd Avenue, 157th Avenue, 181st Avenue, and 187th Avenue intersections. Nine more intersections will get lengthened left-turn lanes. The ramp from westbound Highway 10 to southbound Highway 65 in Blaine will get a double left-turn lane upgrade, too. The Viking Boulevard improvement will create a signalized Reduced Conflict Intersection, the first of its kind in Minnesota. While the intersection will become much safer, expect the intersection’s layout to increase the time it takes to get through it, especially if you must cross Highway 65 on Viking Boulevard. The Bottom Line: A traffic headache now will improve safety at more than a dozen intersections in the future. All of these construction projects affect property owners, whether it lengthens your employees’ commutes or makes it difficult for you to get in and out of your neighborhood. If you’re wondering how these construction projects will affect your property, we can help. Contact Jon Morphew and the Morphew Law Office, PLLC at 612-790-9189 today for a free consultation.